@splashnewsusa -Hershey, PA – Shmuel and Bentzy Marcus, better know as 8th Day have taken the music world by the storm over the past few years. They were quite active over chol hamoed Sukkos with many shows including an awesome, sold out show in Hershey where they premiered their new song “Hoolah”! We got a chance to sit down with them after the show. Here is an exclusive SPLASHNEWS interview, only here on JMR. SPLASHNEWS- Why did you think you would be successful with music that’s not the “typical” Jewish Music? 8TH DAY- Well, it wasn’t really a conscious decision. We didn’t really plan it! SN- Were you surprised when Yalili took off like it did? 8th DAY- Yeh, we were a little surprised. We felt that we had a catchy fun song that would be fun to play and sing and of course we did that video. The hope was that people would catch on and enjoy it as much as we did and fortunately, a lot of people did. SN- Do you think you would have been as successful without the video? 8th DAY- It’s tough to say, you know, to play the “what if” game, but yeh, the video definitely helped a lot and gave it a lot of life. We’re very grateful for that. SN- What’s your favorite food? 8th DAY- Would have to say, probably cholent. SN- What are your plans for the future? 8th DAY- We’re working on this new album and a new video of course, that should come out over the next few months. We also have some exciting tours coming up- Europe, Chanukah tours etc. SN- Where were some of your most electric concerts? 8th DAY- Well, tonight was pretty awesome. (SN-“I don’t work for Hershey…”) Israel is always electric. Great concerts there. We have a lot of fans there. 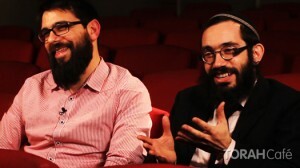 They really Yalili of course and they’re also pretty into “Avraham” and “Smile”. SN- Do you feel a pressure to “top” songs like Yalili and Cheery Bim? 8th DAY- I don’t think so. We try to do new stuff all the time. We just try to keep things fresh and new. SN- What is currently inside your pocket? 8th DAY- Let’s see…(checking pockets) nothing. SN- Who do you look up to as role models in music? 8th DAY- There are so many guys! We grew up with Fried, MBD, Miami Boys Choir, London Boys Choir, Piamenta, Carlebach, Diaspora, etc. We can keep going….Our parents were very into music. They were constantly playing a lot of music including our uncle Avraham Fried whom we’ve been fortunate to perform with. Of course we were also forced to watch a bunch of his shows. Just kidding! SN- Which album is now in your car? 8th DAY- The new (upcoming) album! Early mixes, demos. SN- Any final thoughts for our JMR readers?